"The Complementary Structure of Deoxyribonucleic Acid. "Proceedings of the Royal Society of London A. 1954. 223: 80-96. 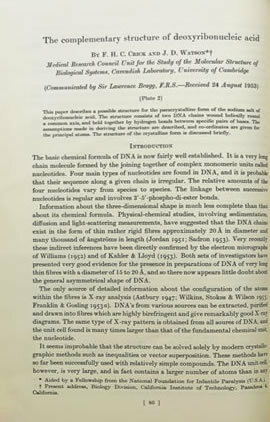 Watson and Crick's paper detailing the discovery of the structure of DNA first appeared in the journal Nature in 1953. One of the most important discoveries in the history of science, it did not initially receive the attention it merited. It is thought that superficial treatment impacted its reception, prompting Watson and Crick to publish the present more detailed account of their findings the following year.